Do you see yourself coming up with one incredible solution after another in a cramped cubicle with a laptop that takes ages to load a page? Well, me neither. The environment in which we do our jobs influences our productivity as much as our own enthusiasm does and a slew of healthy habits that support it. 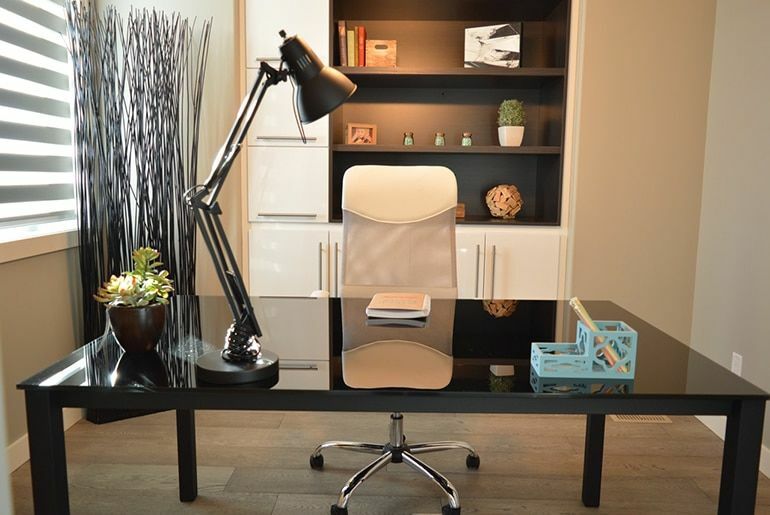 However, office design is often overlooked despite its significance for your productivity, and even minor flaws such as lack of proper lighting can hinder your progress at work. So, before your office starts taking a toll on your ability to work efficiently, let’s see how you can manipulate your environment to foster more productivity. Who knows, perhaps you’re just one LED light bulb or a perky plant away from improving your focus? It’s spring and a perfect time to bring out your mental cleaning supplies to kick clutter out once and for all! However, your spring cleaning efforts at the office shouldn’t become yet another extreme on the opposite side of the spectrum. Removing clutter is the first step of the process, while the second and equally important one is to breathe life into your office. When you’re done arranging your files and techy equipment basics, consider adding some lively greenery, a few personal knickknacks such as your favorite mug, your kid’s drawing, or a family photo. If you have a spacious desk, all three would be fine, as long as they don’t create chaos that will hinder your productivity. But a few items of memorabilia to make you smile can go a long way to boost your morale. The main factor that negatively affects your ability to work is relying on subpar equipment. If your employees do most of their work on computers, supplying them with high-quality ones, such as the Asus Zenbook laptop series, will make for a long-term investment that ensures high performance. You need reliable machinery to serve as the backbone of your business in order to expect top performance from your employees. The same goes for other items that they’ll use every day, from the water cooler and coffee maker to the TV in the rec room that gives them a chance to unwind. If they communicate with clients on a regular basis, how about a pair of noise-cancelling headphones that will make them feel comfortable and let them focus on the conversation without worrying about distractions? If you think that an entirely grey office is a sleek solution, think again. Not everyone, let alone the creative folk, will thrive in a monochrome environment that offers little to no brightness. As humans, we respond differently to various hues. Green can have a soothing effect on your mind, while yellow is often very stimulating for those in the realm of design. It all depends on your field of work and the saturation of colors you choose. Plus, using a single color can be overwhelming for the mind no matter how lovely or inspiring that particular shade may be. You can consult a professional interior designer or talk to your employees to see which colors they find most appealing. Perhaps a combination of two or three shades, such as orange, green, and white, will be the best solution for you. Since we spend most of our waking hours at the office, at nature isn’t the office for the most of us, we frequently experience mood changes due to the lack of natural light exposure. With small, stuffy offices, this becomes an even more serious issue, the lack of natural light and fresh air over a long period of time is a true productivity killer. These imbalances can be minimized if not entirely prevented with the right lighting. For example, LED light is not only eco-friendly, but it’s designed to mimic natural light and help you stay focused and more productive. However, the best possible solution is to stick to large windows, so that every corner of your office can be covered in light all day long. An added lamp for those who work late or have to endure night shifts will be extremely helpful in boosting efficiency. Supporting your employees with specific health issues as well as the rest of your team through the right preventative measures also means investing in their performance. We all know that a sedentary life leads to numerous spinal issues and chronic pain, hence the need to consider healthier options in designing your workspace. Perhaps some of your employees would enjoy a standing desk with an attached treadmill or using a kneeling chair instead of a regular one. Then again, you can offer them those fun Pilates balls which are an excellent way to keep your body active despite sitting down. How about a conference room with no chairs to endorse your standing meetings? There are endless ways you can make your office a more productive environment simply by choosing the right tools – talk to your employees, and they’ll most likely point you in the right direction. David Webb is a Sydney-based business consultant,online marketing analyst and a writer. With six years of experience and a degree in business management, he continuously informs the public about the latest trends in the industry. He is a senior editor at BizzmarkBlog. You can reach him on Twitter or Facebook.